This analysis relates to the programming of historical contents in Spanish generalist television networks. The sample used corresponds to the week from 9 to 15 April, 2018. The study has taken into account the programming as described in the ABC newspaper and deferred online content offered in the TV network’s websites. 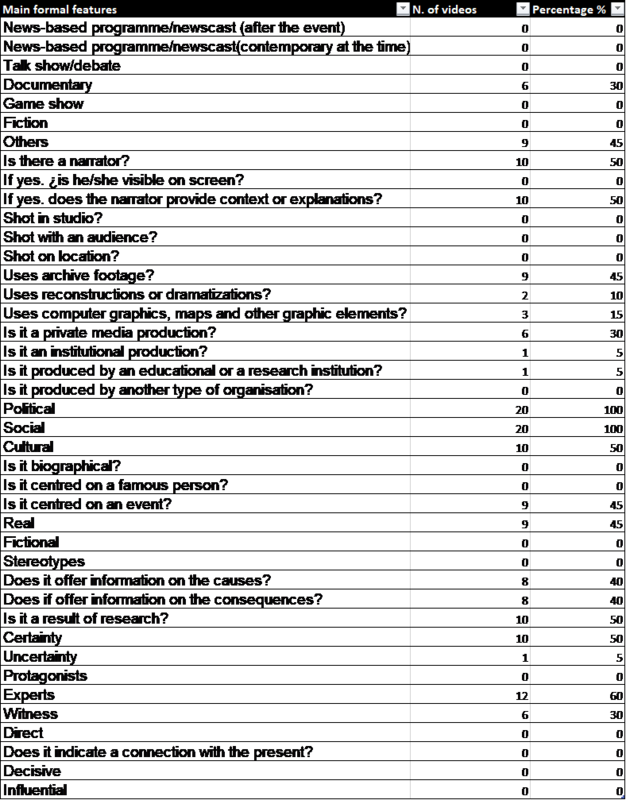 Each program has been described by means of a content sheet which indicates its duration, genre, the presence or not of a narrator, the type of images, the type of network that shows it, and the approach to the historical subject (the period shown, whether it deals with a biography, whether is revolves around a historical character or event, and the type of testimonies it includes). Serials and fiction features which occur at some point in the past but do not include a historical character or the reproduction of a relevant historical event were excluded from the study. The week chosen for the analysis corresponds to date of great historical relevance, both nationally and internationally. In the History of Spain, on April 9, 1977 the Communist Party was made legal; on April 11, 2008, José Luis Rodríguez Zapatero started his second mandate as president of Spain; on April 12, 1983, a Spanish film, Volver a empezar (Garci, 1982), won for the first time the Oscar award to best foreign film; on April 13, 1499, the Universidad Complutense de Madrid was founded; and on April 14, 1931, the Spanish Second Republic was proclaimed. All these historical moments are relevant and interesting enough to have been considered for the weekly programming. Not even the mentioned film was programmed. In addition, renowned international events such as the sinking of the Titanic and the murder of Abraham Lincoln occurred on April 14, in 1912 and 1865 respectively. There is no show that remembers these occurrences in the Spanish generalist networks in their commemoration day. They did not even include the blockbuster films Titanic (Cameron, 1997) or Lincoln (Spielberg, 2012) in the anniversary of the sinking or the murder. Within the historical topics that did get some coverage we can highlight the presence of documentaries and documentary series about the history of some elements of popular culture (comics in the documentary series Superhéroes, la historia interminable; football World Cups in the series De Suecia a Rusia; perfumes in the documentary La fabulosa historia del agua de colonia) or the debate show on Spanish films Historia de nuestro cine. Documentaries or documentary series about relevant historical characters are also present in Spanish national television (the personality of the killer of Malcolm X in the documentary Los caminos hacia Memphis; that of the Spanish architect Josep Lluis Sert in the documentary Josep Lluis Sert, un sueño nómada; or of different historical characters in the documentary series Cartas en el tiempo where letters that they wrote are read aloud and analysed. The rest of the shows are related to events of political interest such as the documentaries Los orígenes del estado islámico and Una historia de no violencia. Pre-history, the importance of the Roman Silver Route or the expulsion of the Moorish are other historical topics that were covered by network programming during the studied period. The public network LA 2 is the network that shows the highest interest in historical contents. Apart from this network, only CUATRO includes a series of interviews related to historical topics in its programming. This is due to the fact that the business group that owns CUATRO, MEDIASET, is responsible for broadcasting the Russia 2018 World Cup, and that is why it includes the series De Suecia a Rusia before the sports section of the news. However, contents related to historical themes are virtually irrelevant in their programming. CUATRO only devoted 45 minutes in the whole week to historical content. The presence of History within the programming of LA 2 is much higher, with the public network devoting a total of 726 minutes (slightly over 12 hours in a week). These hours were distributed throughout the whole schedule, with some presence during prime time (Table 1). But it cannot be said that the amount of minutes in a week or their presence throughout the whole programming means that historical contents are of interest to the Spanish public, due to the low mean share of this network (2.5% -Ecoteuve.es-). Of the shows related to historical contents that were analysed (23), 50% were big-scale documentaries. Seven of the documentaries were part of a documentary series (Superhéroes: la historia interminable; La gran odisea de la humanidad; Ruta Vía de la Plata; Cartas en el tiempo). Another genre related to historical content are interviews. Nine of the programs in our sample were interviews included in the series De Suecia a Rusia about the history of the football World Cup. Its recurrence in every day’s programming (it is shown twice every day) could lead us to believe that interviews compete with documentaries for protagonism, but if we consider their duration, we will see that the true king of historical related content programs is the documentary genre. Interviews amounted to a total of 75 minutes for the whole week, while documentaries occupied 671 minutes of weekly programming (more than 11 hours). A debate show, Historia de nuestro cine, is the only alternative to documentaries and interviews in the television genre of historical themes. 60% of the analysed historical shows corresponded to documentaries related to international events or characters. Their production is mainly from the United States, except in the case of the interviews about football World Cups, which are a Spanish production. The totality of the audiovisual products included a reporter who was in charge of explaining to the camera the historical relevance of the corresponding event or character, or a voice-over narrator who narrated and related historical events. When possible, they included archive footage, and when not, the events are reconstructed. Testimonies from experts or witnesses are also essential when talking about History. History is made available to the Spanish public through documentaries or documentary series, generally international in nature and produced in the United States. There is also space, though, for national themes, especially for illustrious figures in the History of Spain. There are no references to the calendar. Although in the chosen week numerous historical events had occurred in previous years, no reference was made to these events, even when there are well-known audiovisual products available that adapt those events to the screen. History is just not a usual content in Spanish generalist television. Only one network gives History a usual place in its programming, and this is a public, minority network which focuses on culture. It does not show any ads, which means it does not follow the imperatives of the audiovisual market or the tastes of the audience. The ones who do follow them do not show any History-related content except when this content acts as a bait for other content which does attract large audiences and advertisement revenue (as is the case of the football World Cup which comes after the interview series about the history of the World Cup De Suecia a Rusia). It seems like History has been limited to certain speciality networks (Discovery, Canal Historia, etc.) and has been expelled from Spanish generalist programming. History does not seem interesting to advertisers. Two events in recent Spanish history – the legalization of the Spanish Communist Party (9th April 1977) and the proclamation of the Second Republic (14th April 1931)– were selected to analyse their presence on the YouTube platform in June 2018. The analysis was restricted to the 20 most relevant results of those significant events (9-16th April) on any year. Another historical event, the Treaty of Aranjuez which took place in april 12th, 1779 marked the Spanish intervention on the American independence war was also searched on Youtube, but no videos were found about this issue. To select these videos, the number of visits was the main parameter taken into account, as a way to take into consideration the possible influence and diffusion of the clips. On the other hand, the analysis was focused on three axes: relevance (views), engagement (comments, likes and dislikes) and formal features of the videos. 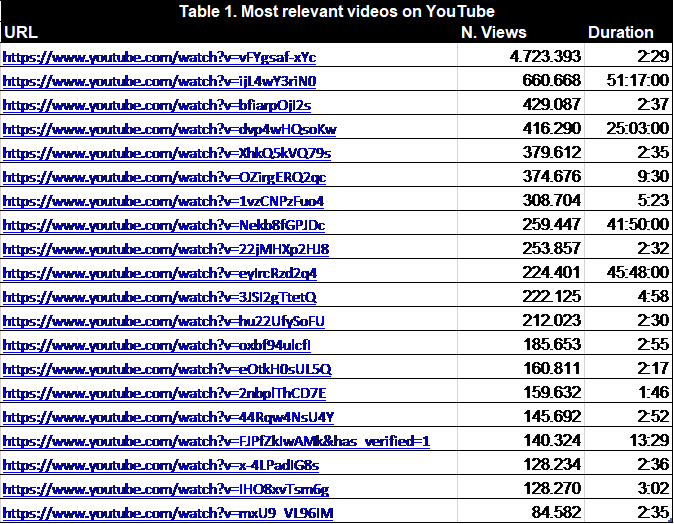 The list of the most relevant videos (see Table 1) reveals remarkable differences among them, especially between the first video and the rest of them. In fact, the first videos total visits (4.723.393) are almost as much as the sum of the other 19 (4.874.088), with a standard deviation of 1.008.431 visits. Excluding the first videos, the average of visits is 256.531, which points that Civil War and the Second Republic are not the most popular topics on YouTube. Also, among the videos not all of them are educational. Almost half of the videos, 9 of the 20, are music videos. Moreover, 7 of them (including the top one) are different versions of the same song, the hymn of the Spanish Republic, before and during the war. Apart of its musical features, this song has become one of the most politized, and is used not only when talking about the Second Republic, but also a political token for the claim for a Third Republic. Therefore, the videos present little diversity in its approaches. This is also present regarding the topics addressed. A first conclusion is there were no videos about the legalization of the Communist Party among the 20 with most visits. This event doesn´t rise the attention of YouTube consumers. In the videos about the Second Republic, there are mentions to the Civil War in 7 of them, be they on the title or the description. Two of them address the Civil War as its main topic, and the Republic appears mostly as context information, as in “History of the Spanish Civil War Chapter 1: The Second Republic is born”. Thus, a second conclusion is that the Second Republic is strongly associated with the Civil War. 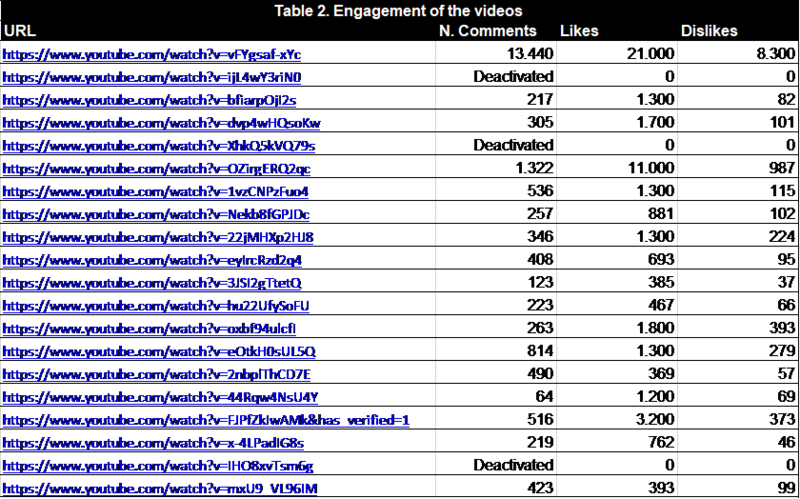 To measure the engagement of the videos, number of comments, likes and dislikes have been taken into account. A first interesting conclusion is that 3 of the videos, 15% of the total, had their comments deactivated, which points to the polemical of the topic. One of the videos is a documentary, but the other two are versions of the Republican hymn, albeit very politized in their descriptions (“the true Spanish hymn”, “quotes by Antonio Machado and images of militias”). Comments are in general controversial and referring to historical interpretations that come from present political ideas (“there should be a republic again”, “hurray for Franco!”), more than an academic discussion. The video with most comments is also the most viewed, a Republican hymn, in which most of the discussion is about the desirability of a new republic, and, less frequently, about the aesthetic qualities of the hymn itself. On the other hand, the second video with most comments is an informational History lesson by a non-academic user, “Spanish Second Republic in 10 minutes: a summary”. In this case, most of the comments about the existence of bias in the video or not, but also about relevant historical events mentioned or not in the video and the users interpretation of them (like the legitimacy of the elections of 1936). Despite this discussion, it should be noted that this video is one of the less controversial, as it has 11.000 likes and only 987 dislikes. The first video, for example, has 21.000 likes and almost half as much dislikes, 8.300. Nonetheless, it is interesting that all videos have more likes than dislikes, in spite of the bitterness of some of the comments. As it has been stated, most of the videos, 9 out of 20, are musical. There are also 3 videos made by educational institutions as part of their programme, like high schools. The other are made by non-academic users, sometimes with political intentions, like a video about the would-be secession of Catalonia from the Republic, and made “as an example to Rajoy (the then President of Spain)”. In other cases, the authors appear to be an informational webpage, like www.artehistoria.com. It is remarkable that there are no fiction and only 2 reconstructions. Also, there are no talk shows or other formats shot in studio. All videos make usage almost exclusively of footage, and thus resort to the usual narrative tools of documentaries to generate credibility, like experts and witnesses.